Fifteen arrangements for eight, thirteen, and twenty note bell sets with CD accompianments. These traditional and original arrangements are for beginning bell ringers. 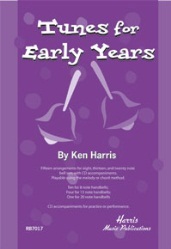 Chord symbols are included and the songs can be played using the chord or melody method. Each arrangement features the song played twice on piano, bass and drums. Bell parts are not included on CD. Click here for sound sample of "London Bridge"
Click here for sound sample of "Rock"